After a recent kernel update, my laptop runs ~20C hotter and uses nearly twice as much power. I believe this happened after a resume from a suspend. Power usage statistics (wattage before -> after) would also be nice. Has 3.8-rc4 fixed it? Test people, test! All kernels >= 3.6.2 and < 3.8 on Sandy (and rarely, Ivy) Bridge processors. I set all those things at first, because I wasn't sure what the setting of -1 meant in those cases. Apparently those things are defaulting to being on. For instance, the i915_enable_rc6 can be set to 0, 1, 3, or 7. 1 will enable rc6, 3 will enable rc6p also, and 7 will enable rc6pp in addition to the other two. But without setting it to 1 on my own, it actually sits in rc6p most of the time (which is a lower power state than rc6, and rc6pp is even lower). So I think that all the rc6 setting will actually set it to use ore power than the default. Frame buffer compression appears to be on by default, as does semaphores. The only one I think you are having a real effect with is the lvds_downclock setting. I am not 100% on this. But I noticed my Ivy Bridge machine actually uses less power when I don't set all that crap, though I have not tried the lvds_downclock parameter. I'm using the same kernel options. I'm also noticing higher CPU temperatures since 3.6.2. EDIT: This is independent of whether I've just resumed or not. As WonderWoofy mentioned, rc6=1 only activates part of the whole thing, rc6=7 activates everything. Though you shouldn't need to play with this stuff anymore, the kernel now handles it automatically. also affected: Thinkpad X220, Core-i5. I've also written something here. Wow. 29W vs. 9W is HUUUGE. Thought my Ivy Bridge (Asus UX32VD) Laptop is affected by a massive power regression. Just compared Kernel 3.5.6-1 with 3.6.2-1. 3.5.6-1: Average: 7.8W; 3.6.2-1: somewhere between 12 and 13 (sorry I need to check again for more precise data, but the fact it's beyond 12 should be enogh .. <60% of the consumption of 3.6.2-1 on kernel 3.5.6-1). Asus UX32VD, Intel core i7-3517U Ivy Bridge(HM76 chipset? ), intel HD4000(i915) + nvidia gt620m(optimus) nvidia+bbswitch for bumblebee, kernel 3.6.2-1-ARCH. Fresh installation here. No boot parameters or modifications. Power consumption is 20-30W and Temperature hangs between 65-90C. Sorry to ask but how do you check the power consumption? powertop should tell you that kind of stuff. lol what can be the problem here? im on x220 i7 and it is hot! I don't know if I was clear enough in the OP. I only get this power regression after I resume from a suspend. Are people having this issue just by default? I found this on the web. Same issue I believe. Well it's the same issue for me. After resuming from suspend my power consumption goes up to 25 W (around 12W before suspend). I have a Lenovo Thinkpad T420s with a core i5 (i5-2410). Using the lts kernel fixes the problem, but produces some other ones. So this isn't really an alternative for me. I recognized previously when switching from 3.3 to 3.4 that the power consumption raised slightly (from 9W to ~12W). Which was already a little bit annoying but this seems to be nothing compared to the latest situation. Yeap, by default, at least here: Asus K53SV, i7-2670QM, Intel HD 3000 & Nvidia GT540M, Linux-(stock, ck or Bede)-3.6.2. I have the same problem, also on Thinkpad T420. It's about the CPU Frequency scaling, which is not working correctly anymore (though it *seems* like it is). Same here. Fan spinning constantly, graphics driver also appears to have broken xf86-video-ati, gnome-shell now using 109% CPU. I have power problems on default system; no relation to suspend. Both CPU and Memory are both minimal. I am getting almost the same reports (I've only got an i5, so 2.5, not 2.7ghz), and it seems that running things with sudo actually prints the correct frequency values. 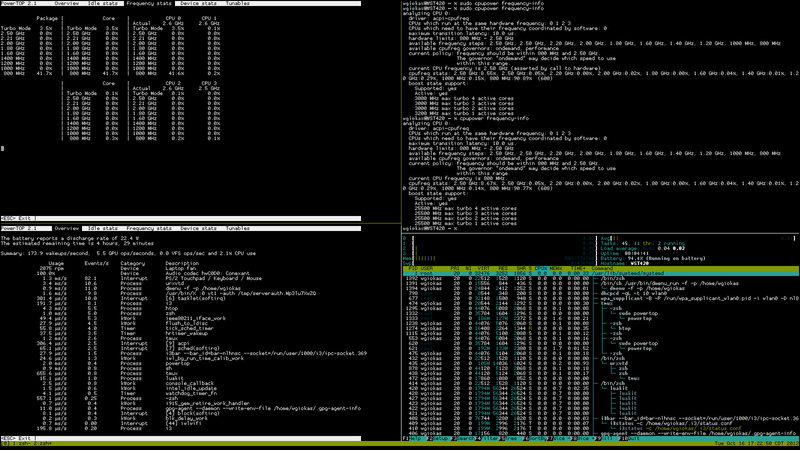 Here is a screenshot of my system running powertop, htop, and showing the output of running cpupower as root and as a normal user. I'm going to take a wild guess that this is something to do with the kernel not respecting our frequency settings. All other power 'things' seem to be normal for me. This is seeming to be somewhat random. I booted my laptop up with i915_enable_rc6=7, and that was working fine, but cpu scaling was still not happening. Then I suspended my laptop to check if the results would be the same. Oddly enough, cpu scaling began working again. There seems to be active work being done on kernel bug 48721, so hopefully something will be found. Just went through another sleep cycle, same results. All I changed was the i915_enable_rc6=7 and it seems to be using reasonable amounts of power so far. @Kaisforza I messed around installed and removed linux-lts. Surprising, CPU Frequency problem is gone. Both reading by aforementioned commands are now same. I tried to suspend and resume. Power consumption is back to normal. System temperature is now between 55-60C which should have been around 50C. I have downgraded until a solution is found.